Right now, MBNA Mastercard has an awesome promotion on! If you are approved for one of their credit cards, using referral code 238 592 117 EF, they will give you a $100 credit on your bill once you’ve spent $150 (must be done by July 14 2014)! The cards that this promo apply to are below, but I must share that I currently have the MBNA Smart Cash Platinum Plus card and I LOVE it! There’s no annual fee and you get 5% cash back for your first 6 months! 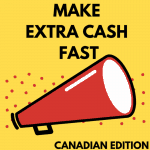 The nicest part about the cash back is that they automatically send you a cheque once you accumulate $50 – you don’t have to remember to request it! A nice and easy way to make a quick $100 and earn more! Next Nestlé Baby Program – Free Stuff!